Mutations in laminin a2 (Lama2) cause muscular dystrophies and myelination defects in humans and mice. 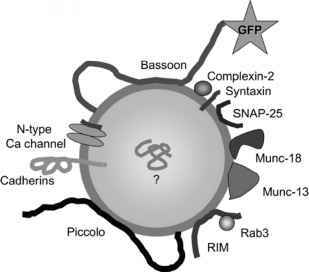 The a.2 chain is the primary alpha chain in most of the extra-synaptic muscle ECM, but it is also found throughout the synapse, superimposed on the laminin a.5 localization. In addition to myelination defects and muscular dystrophy, laminin a2 mutant mice (the spontaneous dy mutation, and also engineered alleles) show mild defects in synaptic morphology and function, including a loss of junctional folds50. The other nerve and muscle phenotypes of these mice make the impact of the mutation on NMJ function difficult to assess, but transmission failures do occur in these mutant junctions51. Genetic analysis of laminin a.4 function in mice has also confirmed its role as a synaptic organizer. Mice with a targeted mutation in the laminin a4 gene (Lama4) no longer have active zones that are in direct apposition to the junctional folds of the muscle fiber49. Also, these active zones are sometimes "split," as though components of the presynaptic density are no longer anchored in the presynaptic membrane. Essentially, the pre- and postsynaptic specializations are no longer in precise register. This phenotype is subtle, requiring ultrastuctural analysis to detect the differences, but it provides an excellent example of how ECM components such as laminin a4 are responsible for establishing the subsynaptic organization of the NMJ. Laminin P2 has been even more extensively studied, and its role in synaptogenesis at the NMJ is broader than that of laminin a4. The gene was targeted in mice, and the resulting homozygotes show NMJ abnormalities52. Unlike in agrin mutants, the NMJs form, but they fail to mature into an adult morphology, the terminal never becomes polarized, with vesicles remaining diffusely localized throughout the terminal, and very few active zones form. The terminals eventually become functionally compromised. A contributing factor for this may be the invasion of the synaptic cleft by the terminal Schwann cell53, decreasing the efficacy of the synaptic contact. Consistent with this, p2-containing laminin-11 (a5, P2, y1) presents a nonpermissive substrate for Schwann cell processes in vitro. Like P2, the a5 chain is distributed throughout the synaptic cleft, and some of the effects of laminin P2 are likely to be mediated, at least in part, by trimers that also contain a5 (laminin-11). Purified preparations of laminin-11 cause neurites to stop and differentiate in vitro54'55. This effect is partially recapitulated by purified P2 alone, but a5 knockout mice (Lama5) have embryonic nerve-terminal defects that are more severe than those seen in the P2 knockout, suggesting that the a5 chain is also playing an active role in this process. The importance of laminins has also been illustrated by biochemical analyses of their protein-protein interactions. Laminins containing the a5 chain can bind to SV256, and p2-containing laminins bind to presynaptic voltage-gated Ca2+ channels 57. These p2-containing trimers also contain the a4 chain. The disruption of the interaction between P2 and the Ca2+ channels results in a disassembly of the presynaptic active zone, similar to that seen in the autoimmune Lambert-Eaton myasthenia58. Through such interactions, the laminins may functionally organize the presynaptic membrane components within the active zone and insure their alignment with postsynaptic specializations in the muscle.